No matter where I look it seems I can no longer find loose-fitting cargo shorts that are long enough to sit below the knee. I have a few pairs of Wrangler shorts that are wearing out and I can't find suitable replacements. The newest version (same exact style) I've found is shorter by a couple inches. I've tried the Wrangler site, Target, Walmart, JC Penny, Amazon, etc, with no luck. Is the style now just tighter and above the knee? Am I out of fashion? But anyway yes, super long "shorts" or "manpris" (man capris) aren't fashionable. I can't help you with your search, but my first thought upon reading the thread title was, "God, I hope so..."
Short length is always one of those clothing things that get debated. The 'in' thing now seems to be shorts that rest right above the knee. I personally like cargo (gasp, the horror ) shorts that go slightly below my knee. Sometimes I may go a few waist sizes bigger to get a longer inseam. Not just no, helll no... lol. No jean material and only slightly below the knee. Example below. Agreed! They're horribly unflattering. I've never seen a single body shape that they look even slightly flattering on. Add on the fact that people end up putting everything including the kitchen sink in those pockets, which makes it look even worse. I just bought a pair recently at Walmart of all places. I wanted a below the knee cut because I hate to exose that part where my prosthetic leg and all the "socks" I wear to knee the leg snug meet near the knee. I recently purchased a pair of shorts at Kohl's. They are cargo-esque style, hitting just below the knee, but they are slightly form fitting (not tight). I think they are much better looking than the overly baggy style and are still very comfortable. Check them out! 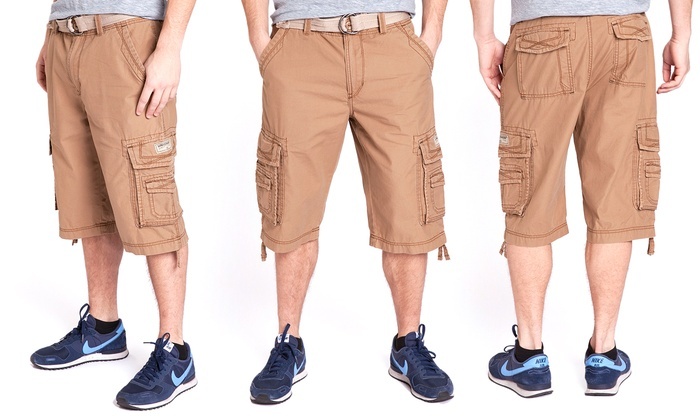 I'm in the minority, but I don't mind khaki cargo shorts on guys...the longer-than-knee length, though, is not a great look, IMO, and nor is super baggy. I'm married to a military member, though, who is diehard on cargo pockets, overall, and appreciates the working uniform-like usefulness and practicality. So he's not likely to give them up, and he gives no craps about fashion, so no qualms about being out of style. His tend to hit right at the knee. I don't clothes shop for him. AFAIK, the bulk of his cargo shorts come from places like Bass Pro/Cabela's, Costco, and sometimes Kohls. But, he is definitely function over fashion.